It was November 26, 2005 when Ken Hemshrot and his son Kenny booked a three day Trophy Musky Hunt with Ernie Lantiegne of Fish Doctor Charters. They caught 3 muskies in 3 days and lost one that they never got to see. The first photo is of Kenny Hemshrot and Ernie Lantiegne with a 50 and 1/4 inch Muskellunge which was safely released. 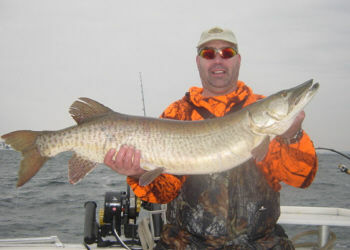 The second photo is of Ken Hemshrot with a 44 inch Muskellunge that was also released. Ken and Kenny are proud to say that Ernie Lantiegne was absolutely one of the best and hardest working fishing guides they have ever had the privilege to fish with. 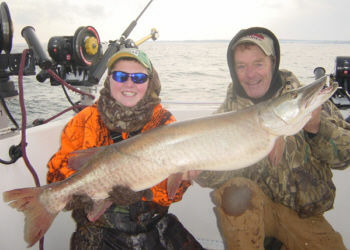 Trophy Musky Hunts with Captain Ernie Lantiegne are strictly catch and release for the simple reason that muskies over 50 inches can be a ripe old age 25 years. There is always the possibility that another angler may get to catch and release the same fish again. Secondly it is much better to have a wild population of muskellunges with a fantastic genetic base to continue the world famous musky fishing the St. Lawrence River and Thousand Islands are blessed with. With a photo and a few measurements it is possible to have replica mount made which will look fantastic and last much longer than a actual mount. These fantastic fish are a valuable resource and with proper care and managment they will be with us for a long time. Two separate strains of muskellunge can be found in New York States waters. The St. Lawrence strain is found in the St. Lawrence River and it's tributaries. They may also be found in Lake Ontario and the Niagara River. The Ohio strain occurs in Chautauqua Lake and the Allegheny River. The New York State record was of the St. Lawrence strain and it weighed in at an incredible 69 pound 15 ounces. This fantastic specimen was caught from the St. Lawrence River by Arthur Lawton in 1957.